Finally, there is some hopeful news in the battle against white-nose syndrome! A team of researchers from UC San Francisco and Brown University published a ground-breaking study in the Proceedings of the National Academy of Sciences about white-nose syndrome. 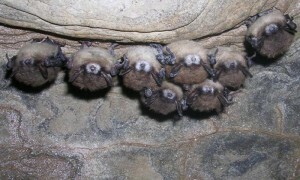 This disease, which is caused by the fungus Pseudogymnoascus destructans, has devastated cave-dwelling bat populations across eastern North America. It causes bats to prematurely wake from hibernation during the winter – this uses up their limited energy stores and results in starvation. Read the entire article.